McDonald’s Happy Meals are getting their fat and calories trimmed, the fast food giant announced Tuesday. The seemingly ubiquitous Happy Meals that have drawn the ire of health advocates and have been blamed for contributing to childhood obesity, will carry apple slices, reduced portion of french fries and a choice of beverage, including new fat-free chocolate milk and 1% low-fat white milk. The core of the Happy Meal will remain the same as kids will still get fries (a smaller portion) and a choice of a hamburger, cheeseburger or chicken nuggets. All beverages, including milk, fruit juice, water and soda, continue to be options for the Happy Meal. The changes are scheduled to begin September with the hopes that all 14,000 restaurants will transition to the new Happy Meals by the first quarter of 2012. The suggested retail price of the Happy Meal will not change, remaining between $2.99 and $3.49. “By adding fruit in every Happy Meal, McDonald’s hopes to address a challenge children face in meeting the recommended daily consumption of produce,” according to the corporation’s statement. 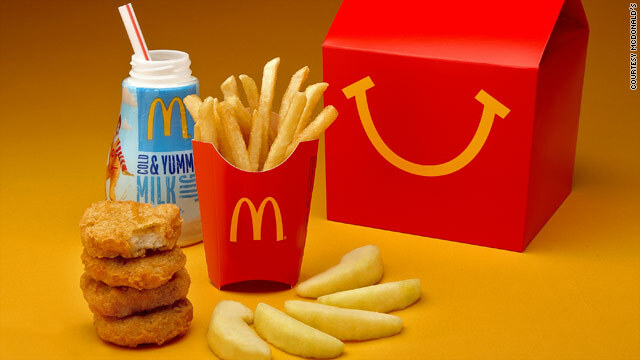 The new Happy Meal with four pieces of McNuggets, apple slices, smaller French Fries and 1% milk has 410 calories, 19 grams of fat and 560 milligrams of sodium. The makeover of the Happy Meal comes after cities and counties began considering Happy Meal toy bans over concerns about nutritional quality and marketing towards children. Happy Meal toys have been banned in San Francisco, and a New York council member has proposed a similar measure this year. Kelly Brownell, director of the Rudd Center for Food Policy & Obesity at Yale University, said McDonald’s had to change its nutritional content because of political and community pressures. First lady Michelle Obama who has spearheaded a public health campaign to prevent childhood obesity commended McDonald's for making "progress today by providing more fruit and reducing the calories in its Happy Meals. I've always said that everyone has a role to play in making America healthier, and these are positive steps toward the goal of solving the problem of childhood obesity." McDonald’s promised continuing changes to the nutrition in its meals. The apples were not very popular in Happy Meals - only 11% of all kid's meal purchases included the fruit option. Many customers were not aware of apples as an option, according to the company. They will become a default item on the children’s meal. The fast food giant also pledged to reduce sodium 15% across the board in its menu by 2015. It recently reduced sodium by 10% in most of its chicken offerings, including the Chicken McNuggets. McDonald’s also vowed to reduce added sugars, saturated fat and calories through varied portion sizes, reformulations and innovations by 2020. « Previous entryIs it OK to be on antidepressants for years? I have a lot of respect that McDonalds is actually doing something to help combat childhood obesity. Though these steps might not seem like a complete fix to the problem I believe that McDonalds is doing all they are required to do at this point to send a positive message. McDonalds is always going to sell greasy burgers and fries because thats how they make money. I have not personally at a a fast food place in over 5 years. It ultimately falls on the parents to not allow the kids to eat this stuff. There is not a single child out there that is paying for this food with his/her own money. Our nation is fat as a result of a lot of bad parents. Number2, I put lemon juice on apple slices to keep them from turning brown and it works beautifully. How do you know they are using chemicals for such an easy thing to fix? What a load of BS from Rotten Ronney's. They don't give a rats behind about the kids. What they care about is keeping our kids and ourself addicted to high fat, salt and sugar and they add toys to keep the kids coming back and keep their profit margins going up and up, all while our children's waistlines grow wider and wider. Lets be real here. So on top of apple slices which have been chemically altered to keep them from browning instead of just giving acutal fresh apples which are sliced on the spot before service, which if you've ever tasted them, they taste chemically altered, they add a container of overly sweetened caramel sauce. I'm sorry, but no parent on the planet should give their kids Mickey Dee's. After eating 4 McNuggest I feel like crap from all the grease and not to mention the entire day's worth of salt in the 4 McNuggets. I would rather take my kids to Scores which is a restaurant here in Quebec and let them have the salad bar with fresh fruit, veggie's, soups, salads, pasta/chick pea/potato salads and know I've fed them better. Shame on McDonalds. We do see through you ya know! So according to Mr. Gupta, McDonalds is the largest buyer of apples. therefore McDonalds is good. What a suckup comment. McDonalds should also be classified as the largest producer of obese human beings in the planet. Nothing McDonalds ever sells could be classified as healthy. Gupta should be embarrassed he made such a comment. Apples and potatoes are on the "dirty dozen" list - the top 12 fruits and vegetables contaminated by pesticides. Chicken, beef, and milk are also highly contaminated with pesticides, hormones, and cholesterol. Who died and made you King. Obama? Matt is completely right. You only get one body and one life (unless you're Shirley Maclaine then you get plenty.) What you put in it and how you live matters. What you put and is what you get out. If you're eating fast food regurlarly because it's cheap and then complain you've suddenly gotten type ii diabetes, high blood pressure, high triglycerides, or any other ailment because you now can't fit into the size pants you're wearing, you have only yourself to blame period. If you're kids are obese and there is no medical reason for it, you have yourself to blame again period! Smarten up people! Healthy Fats ARE good for you, Mcdonalds however is not a healthy fat. Try avocados, cheese, nuts ect. If you want your kids to be healthy you probably dont go to the drive thrus much, you stay home and cook and prepare. I think its a personal choice what you eat, and what you feed your kids. But please be informed, that way when you become obese you will not wonder how it happened. I find it rediculous that McDonalds has changed the Happy Meal because it makes kids fat. What makes kids fat are their irresponsible parents who are lazy & think they need to do fast food daily instead of make a healthy meal at home. In moderation there is nothing wrong w/ McDonalds or any other fast food! Also, I don't want apple slices in my Happy Meal, I want fries & want them to remain the same size. Yes, I am a responsible parent! Thank you! Exactly Right! I too am a responsible parent of four children and sometimes they want apple slices and some times they want fries – so what???? There is no harm. I'm sorry but let's STOP blamming food and look at the fact that kids don't PLAY anymore.... used to be summer vacation meant outside at 9 till noon then back out from dinner to dark! Riding bikes, playing football, swimming, ACTION – not sitting in front of the TV, xBox or computer! THAT is where the problem rests – NOT on having fries with meals! I too want my fries and am tired of everyone else making choices for myself and my children. Well said, anegemomm! exactly!!! me too... my children have been mcdonald deprived their whole lives! Exactly. When I go to McDonald's I am not expecting a healthy meal. That's not what I'm going there for. I'm there for my once or twice a year salt and fat fest. I wouldn't let my kids touch those apples. And don't take away the toys either! I know the food is unhealthy, and that's why I don't go there often. It's not McD's that's making people sick with obesity etc.... it's people's choices. Completely agree! Its the parents and individuals responsibility to watch what they eat. No one goes to McDonalds to get something healthy, you want fries. If you want to eat a healthy meal, then duh...dont go to Mcdonalds. I disagree with cutting the size of the frys and adding apples, they should leave it one or the other. It is going to be alot of wasted apples. I do not buy kids meals for my girls 3-5 years they get a nugget combo and split it. They get more food and its cheaper. Now with that being said we use to do fast food all the time but now with the money the way it is it is a treat to go out. We have went to Mcdonalds and after going thru with drawl there food is nasty. I really cant eat it. It gives us belly aches. Now we have been going to a family resturant that has a buffet and everyone gets what they want. We always start at the fruit and salad bar eat that than move to the main course followed by ice cream if there food is ate. So people that love fast food go without for one month than go try it again and see if you still like it! I have worked the playground at schools for years. I can tell you exactly what these kids will eat. Hamburger, french fries and a soft drink. It will be up to the parent to make sure they eat the apples, drink the milk and other healthy foods. Don't be foolish to think that any child knows what is healthy and what is not, it is the PARENTS responsibility to teach their children to limit themselves to happy meals. How many times a week do some of these children eat at McDonalds, Burger King, Jack in the Box or any other fast food place. Mom comes home from work, too tired to fix another meal and off to get some fast foods. While she happily texts her friends, she is not interested in what her children are eating, it is just too easy to feed them what they want, not necessarily what they need. Parents, stand up and be parents. Say no, fast foods maybe twice a week and that should be the limit. Well said, Sharon! Parents, stand up and be parents! Fast food once in a while was a TREAT for us growing up and it is with my own children. Two of four are out of the house and they still view it as a treat! It's all about choices. We definitely need healthier options out there. My husband and I became vegetarian several years ago and I cannot imagine going back to eating unhealthy. Lucky for us, our kids aren't picky eaters and are willing to try all kinds of food, but as a teacher, I know not all kids are like that. There definitely needs to be more child-friendly healthy options available to families and their children. If any fast food restaurants care about offering healthy choices, and not just appearing to offer healthy choices (i.e. salads that aren't healthy), why don't they have whole wheat buns available? It's not their fault your kids are fat but don't let the facts get in the way of another frivolous lawsuit. Their constant and relentless adversing aimed at children is indeed a major cause. "Hay kids, don't take 'no' from your parents. Demand a Happy Meal today! " I find it absolutely incredible that anyone would blame any fast food restaurant for making anyone fat! No one is forcing people to eat there. We have all kinds of choices in life and if you decide to eat fast food, guess what? You've made a DECISION to do so. If you eat it once every few months, you won't get fat. Eat it several times a week and you do. Simple. I've never been a fan of corporations so I'm not defending them; I'm just tired of people finding everyone but themselves to blame for their choices. No fries and no toys. It is now an "Unhappy Meal" now. "I think so, Brain, but if they called them Sad Meals kids wouldn't buy them." Hamburgers and fries have always been around. Our mothers used to cook with lard. It's not the fatty foods that put on the weight, it's that we exercise less. Our kids are growing up in front of video games and TV, and it's not totally their fault. It's not as safe for them to roam the neighborhoods like we used to. As for my own grandkids, I do buy them Happy Meals and half the time they ask for the apples. The new Happy Meal, by the way, will include both. My little ones never eat all the french fries anyway, so a lesser portion is better. As for the pre-schoolers, the energy they have burns off a heck of a lot of calories. If they're much older than that, the Happy Meal isn't enough food for them. So we're talking about pretty young kids. I think this fuss about McDonald's is really blown out of proportion. Check out the cereal aisle at the grocery store and then tell me what you think the real problem is. I totally agree. Now a 58 year old grandma of two granddaughters, I grew up on homemade pie crust pies, lard fried french fries, and a homemade dessert several x a week. I use olive oil, and rarely make dessert, but did make something when all the family was alive, well, and here. It's all about variety, moderation, exercise, etc. All this ridiculous expectation of everyone for the restaurants to fix our lives, the teachers to fix our lives, and doctor's to come through and fix our lives is ridiculous. When did parents and growing teens/young adults 'deserve' this? We all have a brain. People need to use them to decide their own decisions. I am a nurse and now a high school teacher. I refuse to tell my students WHAT to think. I give them facts and have them write a lot of summaries/opinions through out the year, and they learn so much. We do a confidential 3 day food diary and then I help each one SELF analyze their own choices and they about fall over with what they find out. It is a very informative nutrition unit I love to do. They are so wonderful and they become better at knowing just what they are doing to their bodies. Chocolate bar, fries, and sugary drink for lunch. After school snack: ANY fast food restaurant large fries. Supper. (on the way to their part time job)....more drive through. Most of them analyzed themselves as having: too much sodium, NO calcium, barely any protein, TONS of fat, quite a few carbohydrates. I had them analyze their 3 days of B vitamins, sodium (salt), calciium, and their diet compared to the food guide pyramid. I tell them all year that every person on the planet is accountable for their own choices, of ALL types. First I never eat at McDonalds (hate the food). Anyway I cannot believe this, are we really asking restaurants to parent for us. Also, why are fast food restaurants the target? Slow cooked meals make people fat also (how do you like your pasta). It is NOT the food we eat. it is how much of the food we eat and how much of that food is burned off in our day to day lives. It is the parent's resonsibility to make sure our children eat well and exercise. Just say, "get off the couch and do something physical". My wife and I did that because WE are the parents and they were OUR children. This is called 'personal responsibility', take it. AMEN! I totally agree with you!! So, McDonald's solution is to simply reduce the size of the french fies, but still charge the same. That sounds much more like a drive to increase profits, and doing such while attemping to SPIN IT to be a healthy change. Well, McDonald, you aren't going to FOOL ME. This is SO far beyond the point, but since you seem to be offended that they might be cheating you by reducing the portion of fries and charging the same I will remind you that they are also ADDING a portion of apples. So the kid will get fewer fries, PLUS apples. Instead of a larger portion of fries, OR apples. Is this clear enough now? There is nothing McDonalds could do to make their crap better for children or anyone else – take a look at the people eating there – wake up America – GO VEGAN – meat,meat by products and dairy are not good for anyone – watch the movie FORKS OVER KNIVES – take control of your own health – STOP EATING AT MCDONALDS – OR ANY FAST FOOD FOR THAT MATTER !!! Maybe parents should kick their kids outside to play once in a while instead of blaming their fat kids on school lunches and happy meals!! Some kids are very active and need those calories. Quit making everyone suffer because of the chubby ones! Kids will eat what is available to them. We can "blame" the parents, but most of them aren't any more educated about nutrition than their kids. Inorder to see true change, the govt needs to step in and ban "junk"....(which will never happen). We would have a healthier population and less strain on the health care system as people age! It's surprising how many ailments can be prevented/cured with proper diet. Number 2 – keep them away from the french fries as well! Check out the video on YouTube "The Four Year Old Cheeseburger" to see what McD's french fries are really made of! If people want healthy fast food, pick up a few pieces of organic fruit and go at it. Maybe even a few organic carrots or celery sticks. It's real and real good for you too, not some chemically bathed, peeled apple slices that will probably make kids hate fruit. Last time I checked, it takes less time to reach into your vegetable drawer than sitting in line at some fast food joint. And for the love of all that is good, since when is milk a healthy drink? It has naturally occurring trans fats and animal based saturated fat, both of which are known to lead to heart disease. The calcium doesn't help your bones either, as it is acidifying and leaches minerals, like calcium, from your bones. If it was good for us, then why do the countries with the highest consumption of dairy also have the highest incidences of hip fractures and osteoporosis, as well as breast cancer? If people are so upset about childhood obesity, look at the parents, not the fast food joints. It's the parents who make the money, it's the parents who make the decision of "what should we have for dinner?" it's the parents who end up making bad decisions for their children and buy them a happy meal as opposed to cooking something nutritious for dinner. McDonald's is just a business attempting to keep the public interested and keep people in jobs, if it's so terrible, then don't spend your money there, it's really that simple. Personally, I support McDonald's in their attempt to maintain some form of business in this tight economy, especially cutting a few calories out of a meal that reminds me of my childhood. I'm not saying that I would go there every day or that I go there often, actually I go about once every three months, but now I know that if I want to order a happy meal for myself, I'll get a sweet treat that isn't too terrible for me. Seriously....why can't parents just be parents. If you don't like the nutritional value or lack of from McDonalds, then wow, don't go there. It isn't that hard. I guess Toys R Us and Walmart better stop advertising toys as well because it is focused towards children. And Chuck E Cheese, they need to not advertise on Saturday morning cartoons because the pizza isn't exactly a good meal or the germ infested tubes. It isn't the responsibility of McDonalds to provide your children nutritional food, it is yours as a parent. If you don't like the food – don't take them there. Quit putting the blame where it doesn't belong. There's a problem with this society if they REALLY go to McDonald's looking for healthy food. McDonald's is a TREAT you are supposed to have every so often. I applaud their attempt at trying to make the idiot parents of America happy and add apples to Happy Meals and downsize the french fries, but it's mommy and daddy's job to make sure the children get adequate nutrition. It's funny how people don't want "big" government or anyone to run their lives, yet, they look to McDonald's to feed their children properly. Hmmm.... I love it. I got an idea, how about we take responsibility for our actions. I think that's a MUCH better plan than having McDonald's feed your children apples saturated in chemicals. I think that the fry portions of the new happy meals are R-I-D-I-C-U-L-O-U-S!!!!!!!!!!!!!! You should at least get what your paying for. You're spending like, two bucks on a thing of fries that look like they've already been eaten out of. And also, It's unnatural for mcdonalds to be HEALTHY!!!!!!!!!!!!!!!!!!!!!!!! It's been unhealthy since they first established the place, and now they decide to make it healthy!? COME ON!!! The words mcdonalds and healthy don't mix. That would be mchealthydonalds. mchealthydonalds is too long and it doesn't even sound right! If they want a healthy place, be my guest, although I don't think it will do well. I am upset that my friend took my daughter to McDonalds last week and was told that she COULDN"T order just APPLES!!!! If I take my daughter there I order her 4 chicken nuggets, a bag of apple, and some chocolate milk- just to tied her over until we get home. Now they are making children eat french fries!!! This new happy meal IS NOT healthier for the children who weren't allowed to eat the fries in the first place. Just because McDonald's are wanirng people. We eat food products everyday which contain things which aren't good for us, yet because 90% of the people don't know that it's harmful they eat it anyway. Tbh, it would be a pretty boring diet if we cut everything out that was "bad" for us. Oh and no, I don't work for McD's or any other food company. Someone necessarily assist to make seriously posts I might state. That is the very first time I frequented your website page and thus far? I surprised with the research you made to make this particular submit incredible. Fantastic activity! Howdy! I just wish to offer you a huge thumbs up for your great info you've got here on this post. I will be coming back to your site for more soon. Normally I don't read post on blogs, however I wish to say that this write-up very forced me to take a look at and do it! Your writing style has been surprised me. Thank you, quite great article. I took the grands in a Mcd the other day and they got apple dpireps and there was no caramel. I went and asked for it and the clerk said they didn't have it anymore as they were going "Healthy". I told her if that's the case they should start with the nasty fries and burgers. Uuuuuughh I like the detail they go into, but excltay as it says it's a product of both caramelisation and the Maillard Reaction, and therefore endemic to cooked foods, and thus pointless to warn people about unless you're trying to get them on a steamed and raw only food diet. There is no informed choice to make, since there is no information there. It's quite literally saying "Cooked food may cause certain types of cancer". Which, bee tee dubs, is an inaccurate statement. Please don't spread this around, and let it die an early death. If you want to spread something about this around, give real information, like "Yo! Browning food may or may not lead to cancer! Results of tests regarding this to-be theory pending, but check these links! (link link link)." And +, this is no reason to eat at McDonald's less. There's enough of those reasons to go around, but this one isn't one of them. If it is, it's also enough reason to steam your bacon, and cook your french toast on so low a heat that the egg barely cooks (get yer pan to 185F/85C, and you're good). Between me and my freaky husband we've owned more MP3 players over the years than I can count, including Sansas, iRivers, iPods (classic & touch), the Ibiza Rhapsody, etc. But, the last few years I've settled down to one line of players. Why? Because I was happy to discover how well-designed and fun to use the underappreciated (and widely mocked) Zunes are http://www.nydailynews.com/new-york/pimp-doc-slapped-court-ruling-article-1.1228671. I think you�re totaly right. A close buddy of mine recently shared with me this blog and it's an excellent resource for my school. Helpful website, exactly what I needed. Where in the world do you even find this stuff? I first saw your blog about a year ago and it is really nice to see you are still around. I just had no knowledge of any of this was happeningtoday. Although I have shared this blog with many people, it looks to me like very few people can understand how important this really is.